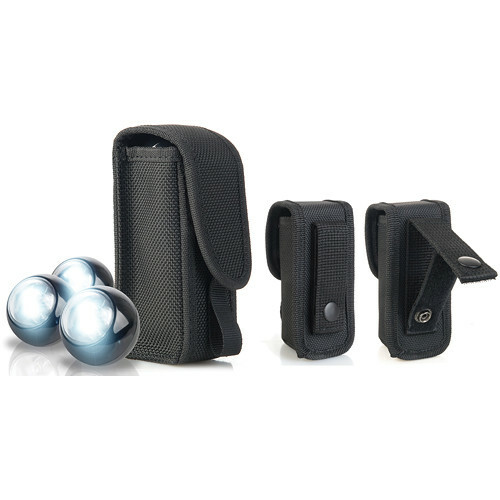 Brite Strike's Tactical Balls (RID-3) are an ideal way to give the good guys the upper hand in standoff situation or the field by diverting and confusing the foe. The 3 balls each contain 2 white LEDs that emit 13,000 MCD. The balls are weighted on one side to roll and wobble irregularly to distract and puzzle your opponent, giving you an opportunity to make your move. Box Dimensions (LxWxH) 5.3 x 2.9 x 2.1"
How big are they? What size? Unfortunately the manufacturer has not published that information. What is the angle of light emitted from these? The manufacturer does not say. The wobble as they roll around so it would be constantly changing.